Keep your drinks cold in a beverage bucket that fits the theme or style of your pool party. This large oval shaped shatterproof bucket is crystal clear acrylic with sturdy handles for easy handling. Even though it is not double walled or insulated it doesn't sweat. Fill it about a third of the way with ice, add your drinks and then top it with some more ice. Many people like the see through feature so at a glance the host can tell if drinks need to be replenished. It will hold 6 bottles of wine or a large assortment of soda, water bottles and juice boxes. Looking for hammered metal party tub? Doesn't this one look great? Not only is it beautiful, it's functional. Insulated so that the tub doesn't sweat and will keep your drinks and ice cold up to 6 hours. When there isn't enough table room for your drinks, a great way to make them easily accessible to your guests is by serving them in a container on a stand rather than in a closed cooler where guests are required to bend down to open a cooler or dig through a tub of ice. This oval shaped party tub comes in two finishes - galvanized metal or antique copper. The galvanized metal is just under $40. It measures 22.5 x 14 x 29.5 inches. Use it with or without the included black stand. The stand is in two pieces and folds for easy storage. A great addition for your outdoor entertaining. This party tub is a bit larger and has the extra tray on the bottom. It will hold 48 cans with ice. Depending on how large a group you have you can go with this one - or I have a friend who has two of the one above and uses both for a large crowd and only one for a smaller crowd. 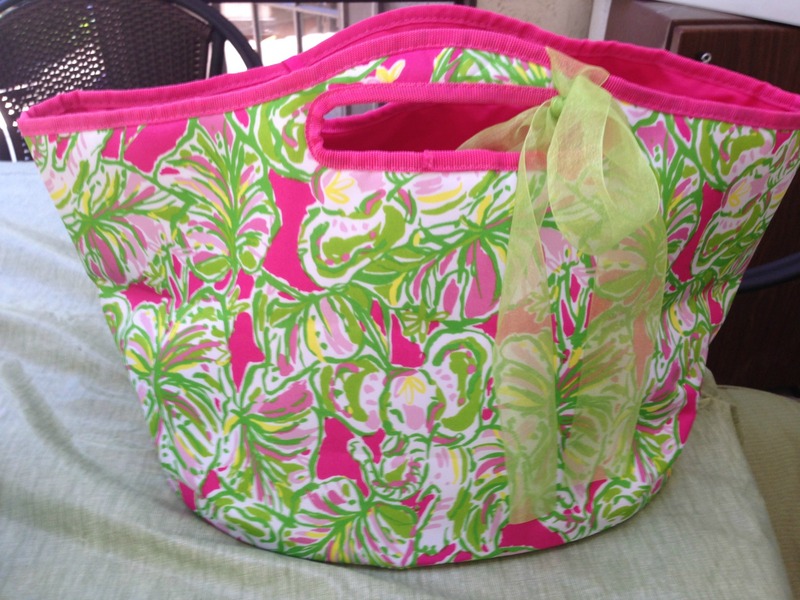 I use our Lilly Pulitzer fabric beverage tub whenever I get a chance. The colorful fabric and sunny design just cheers me up when I look at it. Fill it about half way with ice and then add your drinks and then add more ice. It's used out by the pool on hot days and the insulated fabric keeps the ice fairly cold. An attached bottle opener comes with the bucket. If you like "girly" you'll love this party tub.